Wandering Table's steelhead is raised in the Columbia River. Although the Inland Northwest isn't far from the Pacific Coast's access to a wealth of seawater-sourced proteins, there are plenty of freshwater species to be savored from our region's countless inland lakes and streams. Whether it's the spawning salmon that once sustained the region's Native tribes through winter, or sustainably farmed trout species, diners don't have to look hard to find freshwater fish right here in our own backyard. Salmon, steelhead and trout dishes are nearly ubiquitous at local restaurants, and each species has deep and significant ties to the Inland Northwest's cultural history and culinary identity. For non-anglers, or those simply less aware of common fish species native to our region, it's helpful to note that trout, salmon and steelhead are all members of the salmon family (genus Oncorhynchus). The specifics of each subspecies — like the difference between rainbow trout and steelhead — depend on where the fish spend most of their life; in the ocean (steelhead) or freshwater (rainbow trout), and if they die after spawning (salmon). It's something to consider next time you're ordering; if you like salmon, you'll probably like a dish with trout. Chef Adam Hegsted's philosophy for his flagship, Northwest-centric restaurant in Kendall Yards is for all ingredients on the menu to be sourced within a 500-mile radius (unless, on the rare occasion, it's impossible to do so). For Wandering Table's Crispy Washington Steelhead dish — one that's become a menu mainstay over the past few years — that geographic reach is even smaller. Hegsted sources the fish from a sustainable farm on the Columbia River about three hours from Spokane. "It's amazing that it's a product that comes from the Northwest," he says, "and it's one of the best and most sustainable fish available." The fillet, served in three strips that have been pan-fried in a light dusting of rice flour, is plated atop a rice cake. In a mash-up of textures, flavors and influences — the dish is at once sweet, salty, spicy and savory — the steelhead is surrounded by a soy syrup, a dollop of chile mayo and generous spoonfuls of pickled green chilies and salted cucumbers, the latter in the Japanese sunomono style. "There are two different ways of making food — some people like food that is more subtle, things that are maybe a little more basic; based in the French technique, and the flavors are mellow," Hegsted explains. "Our [food] leans on the bolder side. We're looking for things that are not necessarily challenging, but very approachable and recognizable, and more bold. We want to have sour and savory and sweet and crunchy, and to try to incorporate as many of those elements as possible, so every bite is different, but all the bites are good, too." During a recent trip to the scenic grounds of the Kalispel Golf and Country Club's 1898 Public House in North Spokane — where the crisp evening air is heavy with the scent of lush vegetation — our server shows sincere excitement when we order the Smoked Steelhead Pita. She gushes about how it's her absolute favorite appetizer on the menu, and the results don't disappoint. The large, shareable dish features a grilled pita that's spread with a herbed mascarpone and topped with house-smoked steelhead, candied pickled onions, fried caper popcorn, lemon oil and zest. Executive Chef Tyler Schwenk first brines the Columbia River-farmed steelhead for 24 hours, dries it, then smokes the cured fish for two-and-a-half hours with applewood or hickory chips. "We started it as a smoked steelhead canapé hors d'oeuvres portion, but switched to the pita to share at a table," Schwenk says. "Now everyone can get a bite instead of just ordering the two canapés." The resulting combination of smoky and salty fish with the silky cheese, zesty lemon, chewy onions and crispy capers is a delightful melding of varied yet complementary textures and flavors. Forty-One South, on the scenic shore of Lake Pend Oreille near the mouth of the Pend Oreille River, serves fresh Idaho Ruby Trout year-round as both an entrée and an appetizer. 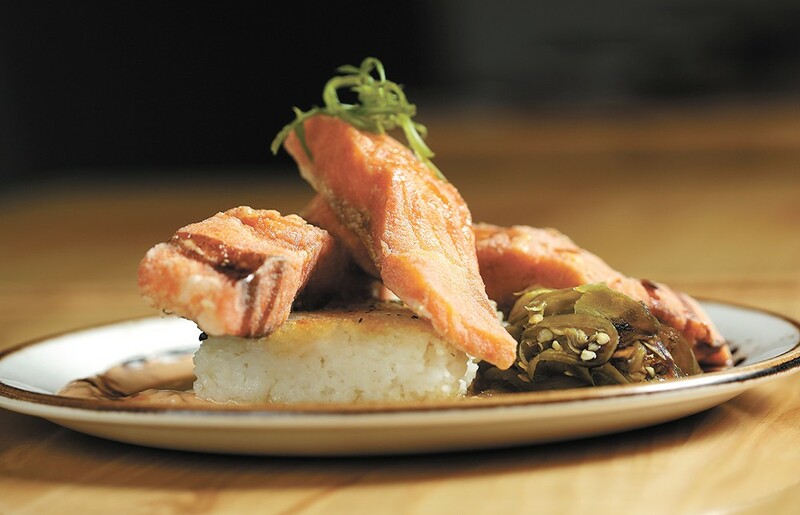 While the preparation of the entrée changes seasonally, the southern Idaho-sourced trout, with its distinctive salmon-pink color (remember, trout and salmon are of the same genus), is a crowd favorite, says owner Cassandra Cayson. Recent preparations of the Idaho trout, Cayson says, include a pan-seared fillet topped with stone-ground honey mustard sauce, and a Parmesan-crusted version with a caper, dill and white wine sauce. In addition to this signature entrée, Cayson notes that Forty-One South's house-smoked trout plate appetizer ($12) is another favorite on the menu. "We cold-smoke Idaho Ruby Trout in-house using hickory, and then bake it," she explains. "After it's cooled, the trout is rolled with cream cheese, almonds and herbs to give it a creamy, spreadable texture. It's a perfect pairing with our housemade lavash crackers. The trout is then garnished with horseradish sauce, preserved lemon and cucumber." Salmon is a mainstay entrée on Luna's elegant and refined dinner menu, the creation of Executive Chef Joe Morris. While the preparation and accompanying veggies or grains on the plate may vary by season, Morris says salmon is a dish that diners can find and enjoy year-round at Luna. During the seasonal salmon runs, Luna is sometimes lucky enough to feature wild salmon as a fresh-sheet special, he adds. For Luna's fall menu's salmon entrée, available in early October, Morris is pan-searing a fillet of sustainably farmed Chinook salmon sourced from British Columbia. The fish is served atop a bed of carrots, Yukon potatoes and kale sautéed in a white wine butter sauce, and garnished with fresh, local greens like pea shoots and arugula.